Struggling to get your child interested in sport? Here are top 3 exercises you can do with your child to help them love and enjoy any sport! 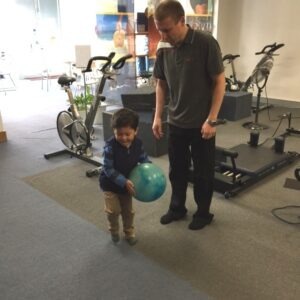 Over the last 13 years, as senior physiotherapists and Pilates instructor, I have trained many children from the age of 7 to teenagers in Pilates, with a very specific purpose. The most common reason is lack of coordination, which often results in shying away from any physical-based activity. This is not innate and can be fixed with training. Working on coordination is a major factor in Pilates, especially for kids. It’s also a great way in helping them develop skills such as performing two different tasks at the same time. One of my favourite activities is having your child jump on a trampoline (or any unstable surface, sand or even on a pillow) and throw a ball to them at the same time. As their skill improves, you can make the exercise more complicated and challenging by throwing the ball higher over their head so they have to reach or to the side of their body or get them to jump using one foot only. Incorporating different physical exercises can increase children’s agility and power. For example, running drills that involve changing direction and speed are great in replicating what your child will need to do on the sports field. A great, simple exercise is to lay out a skipping rope on the ground. With your child standing on one side of the skipping rope, using 2 feet initially, get them to hop over the skipping rope side to side in a zig-zag pattern until they reach the end of the rope. Get them to do this up and down the rope for 2 minutes. They will love it and get exhausted (you’ll be surprised how long 2 minutes of jumping tires out your child). As they get better, they can have a go at this exercise using 1 foot only. There is no doubt that all exercises require some degree of balance whether it’s easy (focusing on one direction) or harder (focusing on two or three directions). 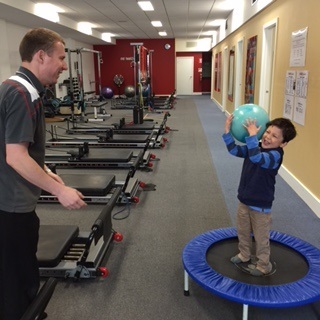 Our aim is to challenge the balance of your child each time, so their brain adapts and their motor skills improve. A simple exercise you can practice to work on your child’s balance and reaction skills is my 4 directions game. Ask your child to stand on one leg. Call out a direction, front, back, left or right and your child has to hop to face that direction. If they get it right, they get a point. If they get it wrong (eg turn left when you call out right), you get a point. First to 10 wins. They will love this game and always want to beat their parents or their siblings. 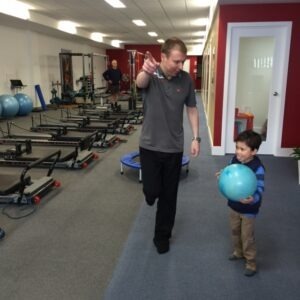 It’s rewarding when we see a difference in a child’s behaviour through these simple Pilates exercises, because we know that what we are doing is working and making a big difference in your child’s sports and social life.